Happy Wednesday friends!! I have an Easter card to share today that I made with the beautiful Simply Said: He is Risen stamp set, as well as the Three Calvary Crosses die and the new Stitched Plaid cover plate. I started my card by inking up some white cardstock with Wild Honey distress oxide ink. I love how easy it is to ink up cardstock with the distress oxide inks! 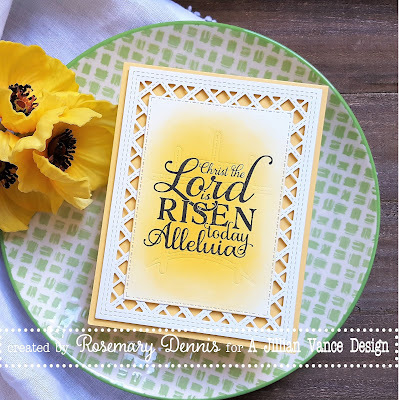 Once that was done I positioned the largest sentiment from the Simply Said: He is Risen set and stamped it with VersaFine CLAIR Nocturne ink. The Three Calvary Crosses was then positioned on the cardstock piece and then embossed into the cardstock. Once that was done I die cut the piece with a mid-size Stitched Dot Rectangle die. 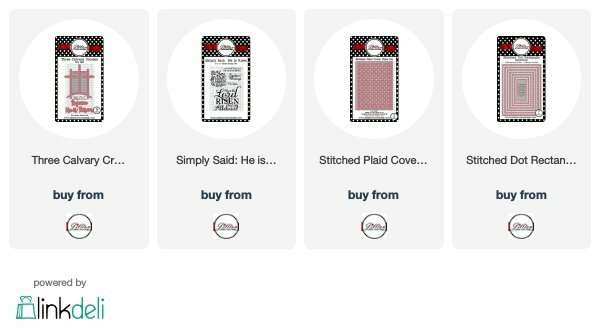 I had been wanting to make something with the Stitched Plaid cover plate since I got it and decided to use it with my card. I die cut some white cardstock and removed all the little bits and pieces. I then adhered the sentiment panel to the die cut piece. Foam tape was positioned behind the rectangle and along the edges of the panel and then the piece was adhered to a yellow cardstock base. What a beautiful way to frame this wonderful sentiment! This is warm, sunny and fabulous Rosemary! One of my all-time favorite cards, Rosemary! Love every single element & how you put them together is just brilliant! Gorgeous Easter card, Rosemary - just love all the layers! !